Acer should be fine they are very hardy...Mine stay out all year ..
Oh my Sandra, your pond and all the planting look so beautiful! 1. When Scott's not there, mark out the area and take the turf off. 2. Stand back and wait. 3. No man can resist digging a hole. The pond is looking great - no wonder you're pleased. My little one i got last week was ok this morning, and you are right there was frost this morning and we are going to get it again tonight, your pond erea looks great. LOL:o))), mine seem to land up near the fountain and waterfall. 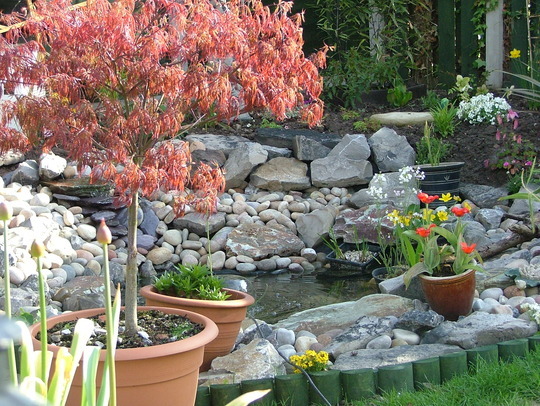 Pond and acer looking great Sandra.Glad you managed to get the water soldiers....good luck ! Ha ha ha!! That's a great idea Muddy....dare I???? You naughty lady! I'm definitely waiting until the winter. I need something creative to do then as I get a bit low in the dark months and doing something like making a pond will cheer me right up! Will take a look tomorrow then Sandra ! This area is looking so good, San,almost a picture postcard! You must be so very proud of what you and Baz have achieved between you! That looks beautiful. I have shown your pond photos to a friend and it inspired her. She only has a very small garden so she is scaling it down but has already dug the pond out. She will love this photo too. I will get some photos, the way she is going it will soon be finished (lol) . I think I'll buy some snails. Everyone said they would just arrive on their own but I've never seen one in the pond. We started with 6 shubunkins and 2 golden rudd and at one point had 33 fish, which was too many for our little pond. We were going to give some away but mr heron saved us the bother. They're very smart these herons. They get to know your routine and often strike very early in the morning. We put a net on at night now as he took 13 fish in one strike and injured 2 others that later died. The net looks ugly but does the job. The Heron can't land on the waters edge and has to be able to walk to it. We have a combination of shrubs, pots, a wall and a low removable trellis around the pond so the only accessible bit was the waterfall. The net doesn't go right down to the ground so the frogs have no problem going under it. I have recently been tempted by a product called Netfloat, that would look better than a net, but would be more of a permanent feature, but I do like the idea of being able to remove my net completely during the day when we're home.